Climate change is rapidly warming the Earth and altering ecosystems on land and at sea that produce our food. In the oceans, most added heat from climate warming is still near the surface and will take centuries to work down into deeper waters. But as this happens, it will change ocean circulation patterns and make ocean food chains less productive. In a recent study, I worked with colleagues from five universities and laboratories to examine how climate warming out to the year 2300 could affect marine ecosystems and global fisheries. We wanted to know how sustained warming would change the supply of key nutrients that support tiny plankton, which in turn are food for fish. We found that warming on this scale would alter key factors that drive marine ecosystems, including winds, water temperatures, sea ice cover and ocean circulation. The resulting disruptions would transfer nutrients from surface waters down into the deep ocean, leaving less at the surface to support plankton growth. As marine ecosystems become increasingly nutrient-starved over time, we estimate global fish catch could be reduced 20 percent by 2300, and by nearly 60 percent across the North Atlantic. This would be an enormous reduction in a key food source for millions of people. Marine food production starts when the sun shines on the ocean’s surface. Single-celled, mostly microscopic organisms called phytoplankton – the plants of the oceans – use sunlight to photosynthesize and grow in a process called net primary production. They can only do this in the sunlit surface layer of the ocean, down to about 100 meters (330 feet). But they also need nutrients to grow, particularly nitrogen and phosphorus, which can be scarce in surface waters. Phytoplankton, the plants of the ocean. Phytoplankton are consumed by zooplankton (tiny animals), which in turn provide food for small fish, and so on all the way up the food chain to top predators like dolphins and sharks. Unconsumed phytoplankton and other organic matter, such as dead zooplankton and fish, decompose in surface waters, releasing nutrients that support new phytoplankton growth. Some of this material sinks down into the deeper ocean, providing food for deep sea ecosystems. Carbon, nitrogen, phosphorus and other nutrients in this sinking organic matter ultimately are decomposed and released at depth. This process, which is known as the biological pump, continually removes nutrients from surface waters and transfers them to the deeper ocean. Under normal conditions, winds and currents cause mixing that eventually brings nutrients back up to the sunlit surface waters. If this did not happen, the phytoplankton eventually would completely run out of nutrients, which would affect the entire ocean food chain. Nutrients that sink to the deep ocean eventually return to the surface mainly in the Southern Ocean around Antarctica. North of Antarctica, strong westerly winds push surface waters away from Antarctica. As this happens, deep ocean waters that are rich in nutrients rise up to the surface all around Antarctica, replacing the waters that are being pushed away. The zone where this upwelling occurs is called the Antarctic Divergence. When winds displace surface ocean waters, nutrient-rich colder waters well up from below. Today there isn’t a lot of phytoplankton growth in the Southern Ocean. Heavy sea ice cover prevents much sunlight from reaching the oceans. Concentrations of iron (another key nutrient) in the water are low, and cold water temperatures limit plankton growth rates. As a result, most nitrogen and phosphorus that upwells in this area flows northwards in surface waters. Eventually, when these nutrients reach warmer waters throughout the lower latitudes, they support plankton growth over most of the Pacific, Indian and Atlantic oceans. Our study demonstrated that sustained, multicentury global warming could short-circuit this process, leaving all ocean areas to the north of this Antarctic zone increasingly starved for nitrogen and phosphorus. We used a climate model simulation that assumed nations continued to use fossil fuels until global reserves were exhausted. This climate path would raise mean surface air temperature by 9.6 degrees Celsius (17.2 degrees Fahrenheit) by 2300 – nearly 10 times the warming beyond pre-industrial levels recorded up to the present. Scientists already know that the poles are warming faster than the rest of the planet, and in this scenario that pattern continues. Eventually the oceans would no longer freeze over near the poles, even in winter. Warmer ocean waters without sea ice, aided by shifts in winds that are also driven by strong climate warming, would greatly improve growth conditions around Antarctica for phytoplankton. This increased growth would trap nutrients that well up near Antarctica, preventing them from flowing northwards and supporting low-latitude ecosystems worldwide. In our simulation, these trapped nutrients eventually mix back to the deep ocean and accumulate there. Nitrogen and phosphorus concentrations in the upper 1,000 meters (3,300 feet) of the ocean steadily decrease. In the deep ocean, below 2,000 meters, they steadily increase. Large, brilliant clouds of blue in the dark waters of the South Atlantic are phytoplankton blooms. Nutrients drifting north from Antarctica fuel these blooms, which provide food for larger plankton and fish. As marine ecosystems become increasingly nutrient-starved, phytoplankton growth and net primary production throughout most of the world’s oceans would decline. 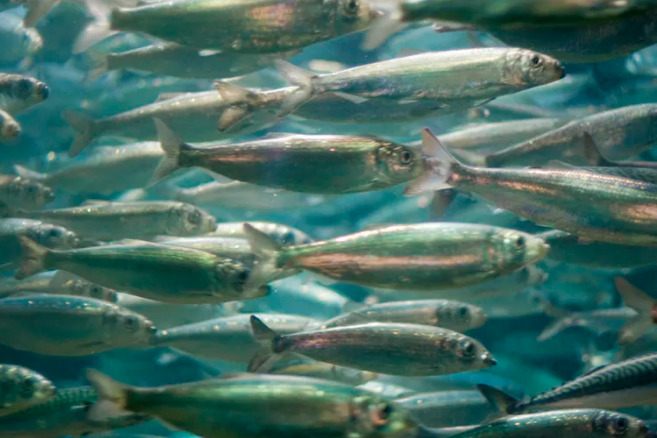 We estimate that as these impacts ripple up the food chain, global fish catches could be reduced 20 percent by 2300, with decreases of more than 50 percent across the North Atlantic and several other regions. Moreover, at the end of our simulation net transfer of nutrients to the deep ocean was still taking place, which suggests that ecosystem productivity and potential fisheries catch would decline even further beyond 2300. Eventually, after more than a thousand years, most of the carbon dioxide that human activities have added to the atmosphere will be absorbed by the oceans, and the Earth’s climate will cool back down. Sea ice will return to polar oceans, suppressing phytoplankton growth around Antarctica and allowing more upwelled nutrients to flow north once again to lower latitudes. But even then, it will take centuries more for ocean circulation to fully replenish nutrients in the upper ocean. Ocean resources are already stressed today. About 90 percent of the world’s marine fisheries are fully fished or overfished. World population is projected to increase from 7.3 billion in 2015 to 11 billion in 2100. The impacts that we found in our study would have serious implications for global food security. Expanding aquaculture, or even more drastic steps such as directly fertilizing the oceans to spur plankton growth, would not even come close to making up for the loss of nutrients to the deep ocean driven by sustained global warming. Our simulation was based on a strong climate warming scenario. More research is needed to explore just how warm the climate has to get to melt sea ice and initiate Southern Ocean nutrient trapping. But clearly this is a tipping point that we don’t want to cross.